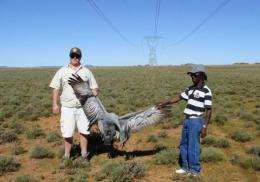 Men hold an electrocuted blue crane in this undated picture taken in South Africa. In Africa and Eurasia alone, tens of millions of birds die each year in collisions and hundreds of thousands of others are electrocuted, a study published in November 2011 at Convention on Migratory Species in Bergen showed. There are some 70 million kilometres (43 million miles) of power lines on the planet. In Africa and Eurasia alone, tens of millions of birds die each year in collisions and hundreds of thousands of others are electrocuted, a study published at this week's Convention on Migratory Species in Bergen, Norway showed. Alongside hunting, "collision and electrocution are among the most important human-related causes for bird mortality," Dutch ornithologist Hein Prinsen, the rapporteur of the study, told AFP. Migratory birds have in many cases already seen their habitats destroyed by mankind and global warming. These accidents are pushing their numbers down further, and in some places even putting birds at risk of becoming locally extinct. Each death is a heavy blow for the bigger species who have relatively slow reproduction patterns. For cranes and storks, the death of an adult bird can lead to the death of its young, who depend on their two parents for survival. "Today, Eastern Europe is a hot spot for problems, for great bustards and birds of prey for example," said John O'Sullivan, a former member of the Royal Society for the Protection of Birds. A man mounts a stop for birds on a power grid in this undated picture taken in Germany. In Africa and Eurasia alone, tens of millions of birds die each year in collisions and hundreds of thousands of others are electrocuted, a study published in November 2011 at Convention on Migratory Species in Bergen showed. "But the worst situation may well be soon to be found in India and Africa where vast amounts of power lines are being built and where there are very large populations of birds," he added. In South Africa, 12 percent of blue cranes -- the national bird -- die each year in collisions with electricity wires. Collisions are more likely to occur in areas where birds congregate, such as near their watering holes and in flight corridors, while electrocutions are more common in areas with little vegetation where there are few natural places for the birds to perch. "There's definitely a high cost for society in the form of power cuts which generate costs for the industry and all kinds of costs such as accidents" caused by blackouts, O'Sullivan said. "So from a financial point of view it completely makes sense to solve this problem," he said. Such accidents can have unexpected consequences. "Especially in dry areas in the US and Eastern Europe, it has happened that the bird which gets burnt falls down in flames and starts a wild fire," Prinsen explained. In order to prevent accidents, the authors of the study listed a series of steps that can be taken. The most obvious is to have electricity cables buried underground, a solution already in place in parts of the Netherlands, Britain and Denmark though it is the costliest of remedies. Given the current economic crisis, other simpler solutions that have been proven to work include making the cables more visible with markers, equipping the poles with perches, or reinforcing the wires' insulation to prevent electrocutions. 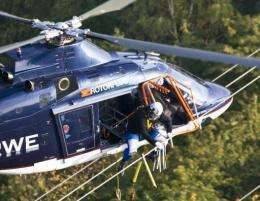 The study showed that such modifications to Hungary's 46,000 kilometers (28,580 miles) of electricity cables would cost around 220 million euros ($291 million), 10 times less than the cost of burying the wires underground. WSU research biologist says only matter of time before avian flu virus reaches U.S.